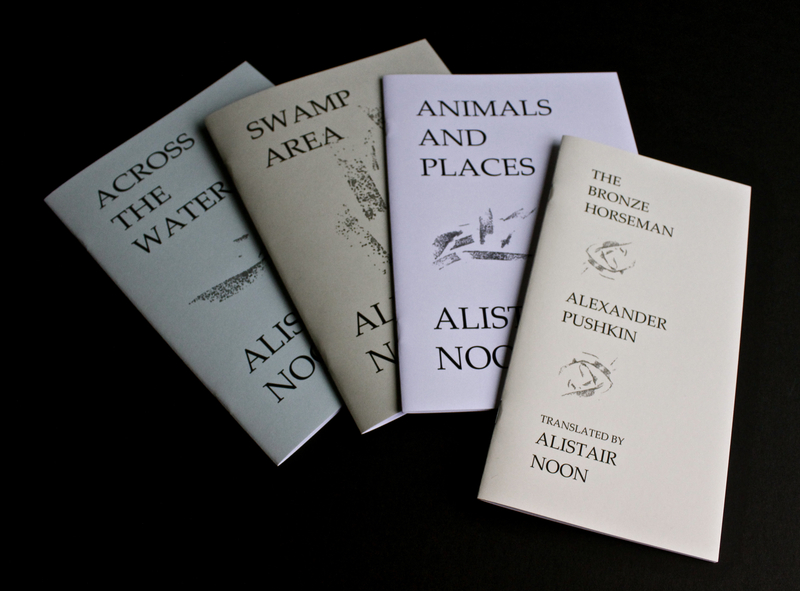 Across the Water (2012) is a 24pp pamphlet; Swamp Area (2012) is a 36pp pamphlet; Animals and Places (2010) is a 20pp pamphlet (all 3 are A5 format). Listen to Filling the Triangle and Hill with Bunker and Flak Tower from Swamp Area. Read Susie Wild’s review of both pamphlets (for Sabotage) here. Listen to Alistair Noon on Archive of the Now. 2010. Pamphlet. New translation of Pushkin’s poem. You can read Alistair Noon’s commentary here. Longlisted for the Rossica Prize 2012. I would say that this is one of the best translations of The Bronze Horseman that I have read; it has a very palpable feel for Pushkin’s poem and at the same time appears to do more with it than I have ever seen. – Catherine Woodward, Eyewear, January 2011 (read the full review here).